We planted the Old Camp Vineyard for Ron Stockman and Susan Hubbard in 2006. The vineyard slopes gently toward the southeast promoting excellent drainage of the loamy, rocky soils. We selected a moderately vigorous rootstock to pair with the Pommard and 667 Dijon Pinot Noir Clone. The combination of the slope, the soils, and the row orientation give this Russian River vineyard the ability to produce excellent fruit that consistently shows wonderful notes of strawberry and cherry with earthiness reminiscent of a dense forest floor. 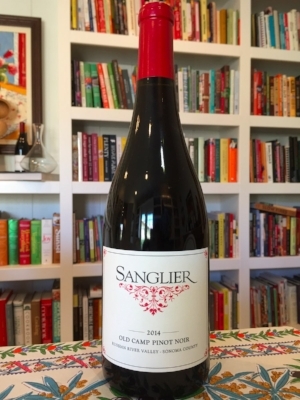 Old Camp Pinot Noir is perfectly suited to pair with a variety of food thanks to its bright acidity, black fruit layering, and spiced cola notes. It pairs well with either delicate foods (think salmon) or rich, comfort food (like Melissa’s Pork Stew). The ruby color in the glass Just don’t forget: don’t serve this wine too cold, or you’ll miss out on the subtle yet mouth-filling tannins and all of the lingering cedar and fig notes.